January 29, 2012—Been there, done that—Quarzsite, that is. It was an experience, for sure. Thousands upon thousands of RVs, parked in the desert, in resorts, in dry camps, and off the highway. And the tent city! It was something every RVer should experience once. And once is probably enough, especially if you are not fond of the desert. Quartzsite, as I think I already described in a previous blog, is a small community of perhaps a few hundred inhabitants from April through November of each year. Then come of the snow birds. And the venders. We finally figured it all out (again, I may be repeating myself): The town hosts several large consecutive expos, the largest, perhaps, being the RV expo. This is held in a massive tent, which I estimate was at least 30 yards wide by about 400 yards long—big enough for several three-ring circuses. Hundreds of venders lined the aisles. Outside there were more. It was like a home show in McCormick Place in Chicago. We actually bought several things for our motorhome (and us)—at good prices. Jim bought a more efficient water pump replacement. He replaced some of our interior lights with LEDs. He also bought a shut-off valve for our new Oxygenator shower head (this works very well, but it’s shut-off valve was cumbersome to use). I found a new wallet, and of course, we bought some “destination” tee shirts. We found a grocery that sold cereal and canned goods at very reasonable prices, and we bought some dried fruit and nuts. Altogether, we probably made at least a half-dozen trips into Quartzsite to roam around as well as to purchase specific items. We had been staying at the Colorado River Oasis on the Colorado River, at Exit 1 on I10, about 18 miles from Quartzsite. It is now our “home base” for this RV membership club. This morning we pulled up stakes and headed south to Winterhaven, Calif., eight miles west of Yuma, Ariz.
Garmina (our GPS) decided to take us on two-lane country highways. 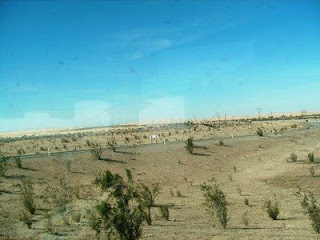 We had never seen such desolate country before! It was so arid I would be surprised if anything lived out there except some sage brush. Most of the land is owned by the federal government, and ATV enthusiasts have almost a free reign over it. Eventually we spotted our infamous Imperial Dunes. (Remember my blog from last August, when our “toad” became mired in the sand?) In the pictures I’m posting you can spot the dunes by their contrasting color to the rest of the countryside. They are much lighter in color and look, well, like dunes, even from a distance. The dunes are the light-colors at the horizon. This is taken out of the RV window. The dunes are the light colors at the horizon. Compare them with the desert in the foreground. 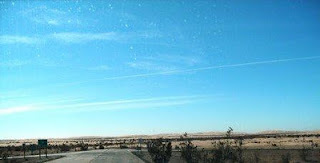 It turns out that our RV resort is located almost of stone’s throw from the dunes, in Imperial County, California. I doubt that we will be visiting them again; once was enough. We drove into Yuma for an early dinner. What a difference from last August! Now the city has people in it—probably way too many. If I had to live in the desert for the winter, I would much prefer Yuma to Quartzsite. At least Yuma has amenities; Quartzsite has none. Tomorrow we head south of the border, to visit our dentist. We will probably be here for a week, and then, who knows where? All in all, it was a good birthday. (Oh, yes, I forget to mention that today was my 67th.) Calls from my kids, e-mails and greetings from siblings, a nice dinner out, and settled in for the night…what more could I ask?